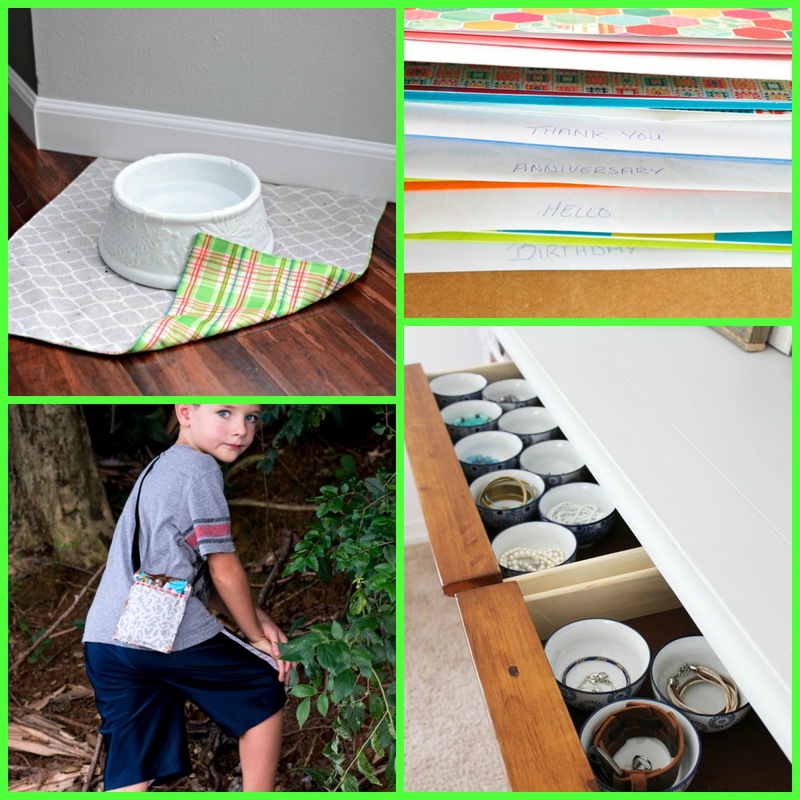 This week I am sharing another kid's craft book, however before I begin I thought I would share what craft I have been working on. I picked up a project that I started ages ago and haven't worked on in quite awhile. 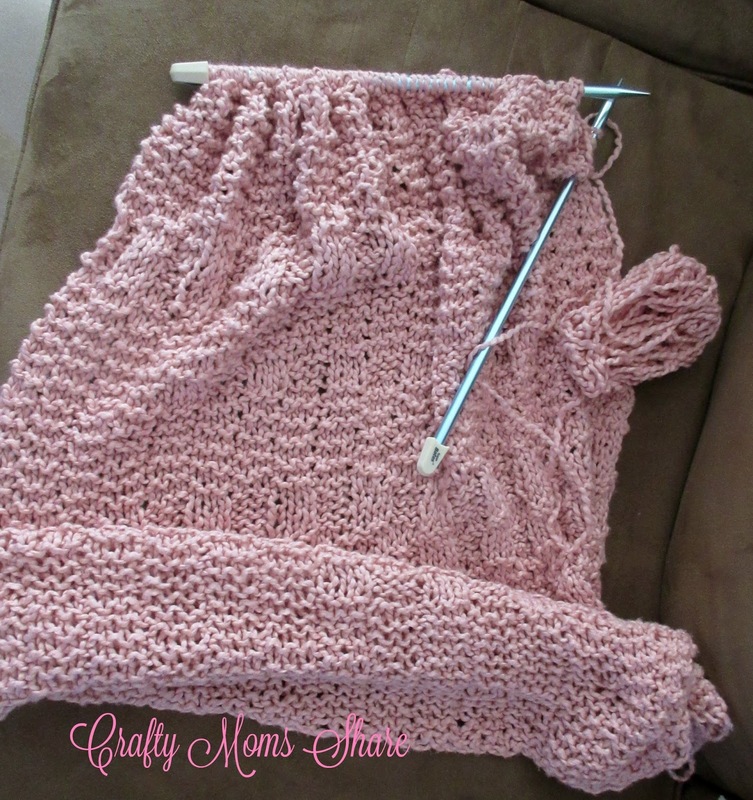 It is a prayer shawl that I am making for myself. There are many different styles to prayer shawls but basic ones use a pattern of three stitches and then three of a different type. Three of course represents the Trinity. While knitting the knitter prayers for the person the shawl will go. I did the simple knit three, purl three repeated across the row of around 63 stitches. I am using an organic cotton on size 13 needles. My work is full of mistakes, but so is my life, so I think it all works. Now onto our book for this week. 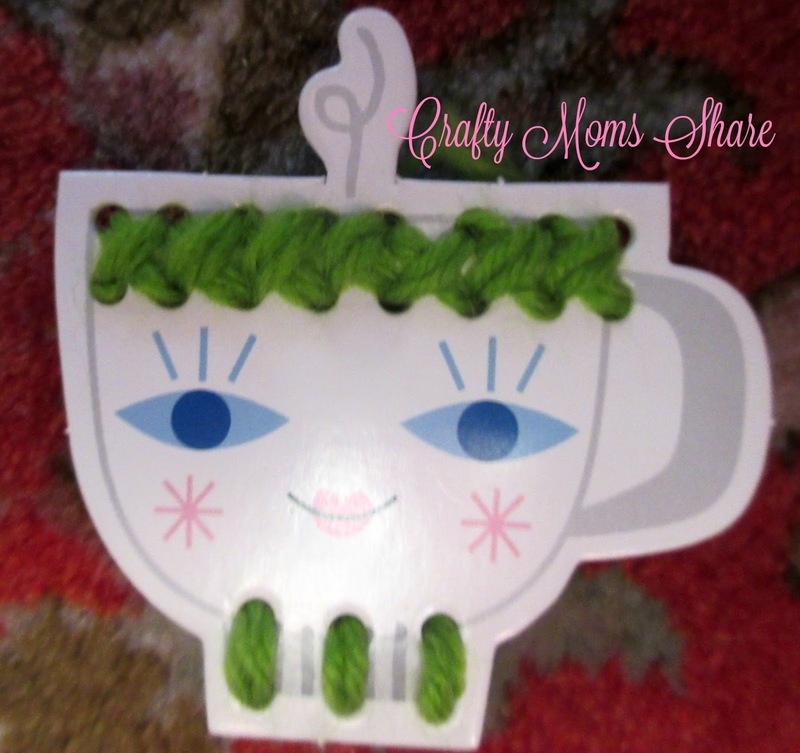 It is Fun with Stitchables! by Suzy Ultman. 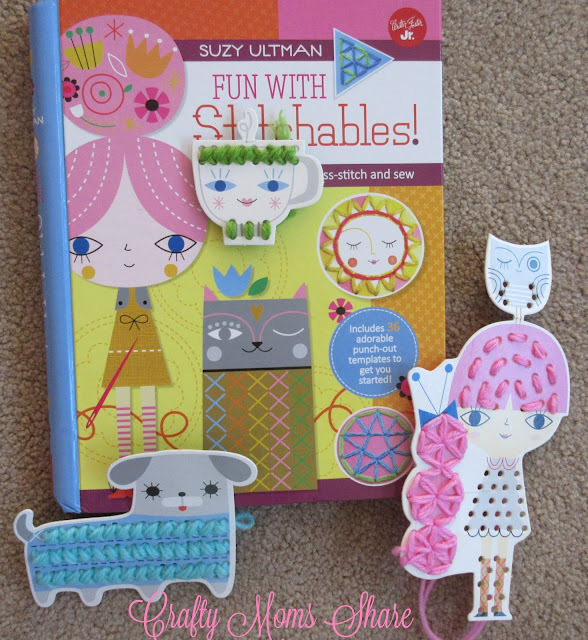 This book is to teach kids how to cross-stitch and sew different types of stitches. The book starts with the supplies needed: yarn or embroidery floss, scissors, and needles with the optional needle threader. I wish a needle came with the book, but this is really a minor issue. 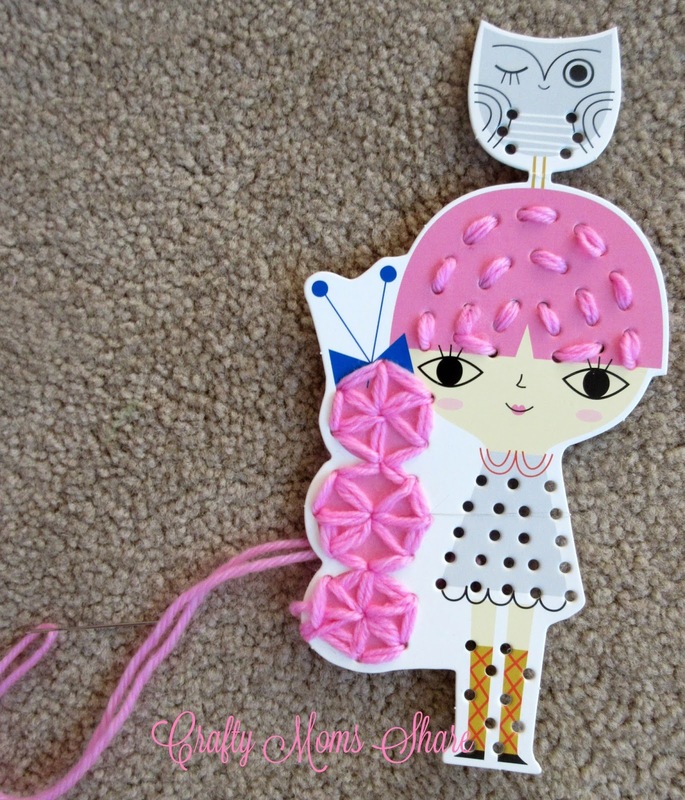 Next are instructions to thread the needle with a needle threader and how to knot the end. Then there are instructions for the basic stitches: straight stitch, cross-stitch, seed stitch and back stitch. Then there are tips, ideas and such for the projects. Next there are pages with pictures of many of the projects so the stitches can be planned out in color. 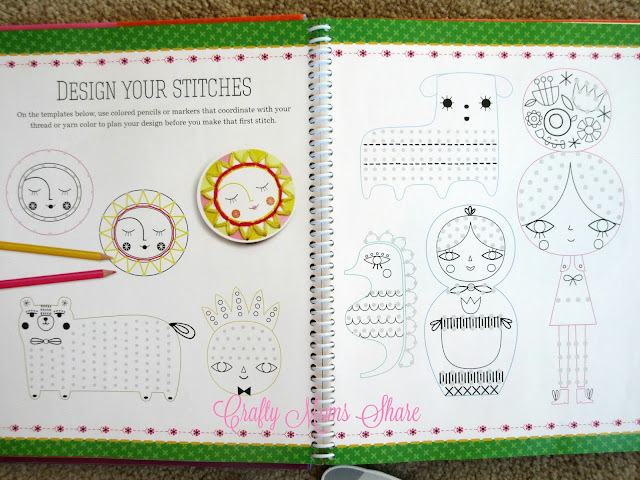 Finally there are pages of light cardboard punch-outs that have holes for the sewing. We used some yarn from a crochet kit my mother bought Hazel since we were at my parents house when we started this. 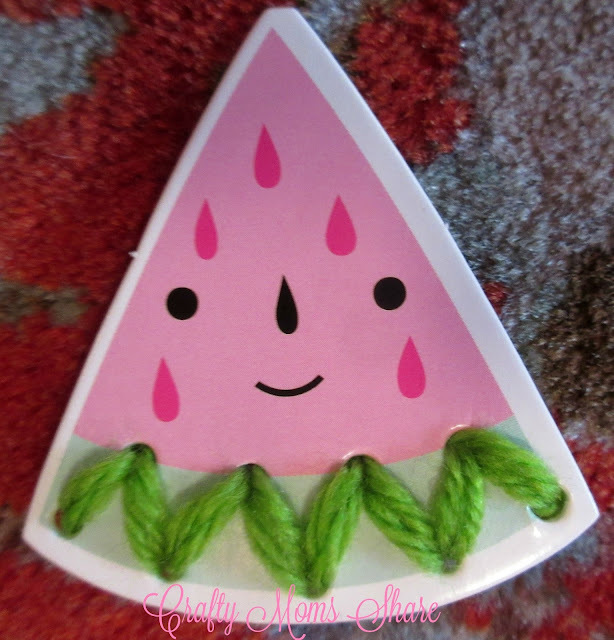 The first one we did was the watermelon slice. Next she did the tea cup. This introduced the straight stitch as well as the cross-stitch. Next she tried the dog. We actually started trying to plan the plain square, but I realized she needed more experience in the stitches before doing the basic shapes so she could really plan what she wanted to do with them. She really enjoyed this cross-stitch project. It may be time to pull out some of my cross-stitch supplies for her. I was really into it in high school and college so I have quite a bit of them. Next she started this girl. I helped her with finishing the circles since she had trouble with the full holes. We should have used embroidery floss for this one!! Oh, well, it worked. 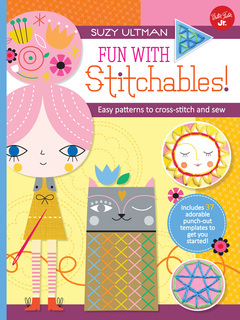 Overall we love this book for teaching different stitches. It is more fun than the lacing cards and teaches more. 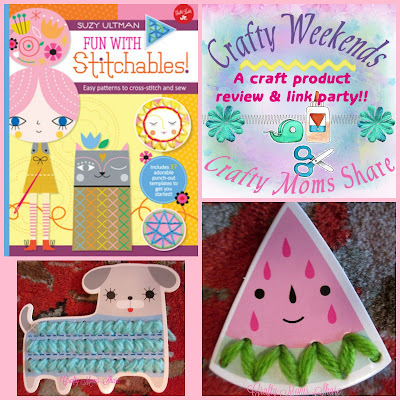 It is a great introduction to various stitches and learning some sewing techniques as well as embroidery stitches and is an easy way to practice them. We recommend this one!! Thank you to everyone who shared with us at last party!! It was one of our largest Crafty Weekends yet and packed full of beautiful crafts and inspiring ideas! Below are some features from the party, but this is just a small sample of great ideas shared! 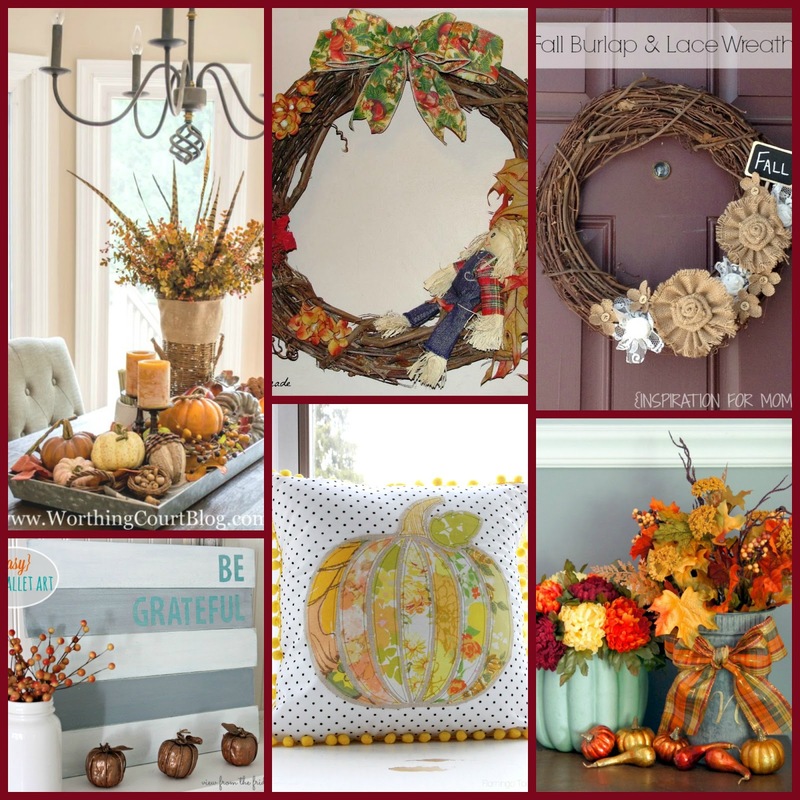 This week the features are in three groups: Fall, Halloween & More and Other Fun Crafts.